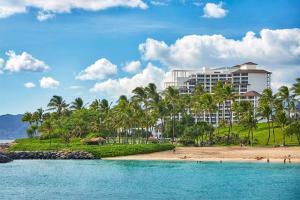 Four Seasons Resort Oahu at Ko'Olina balances a classic Hawaiian style with one-of-a-kind luxury. The resort offers 370 guest rooms and suites with breathtaking views of the Pacific Ocean and Ko Olina's turquoise lagoons. Guests will enjoy the lively pools and outdoor water activities right off the resort's white-sand beach. Tranquility finds a home at the magnificent Naupaka Spa and Wellness Centre. Located on the island of Oahu, about 35 minutes from downtown Honolulu.